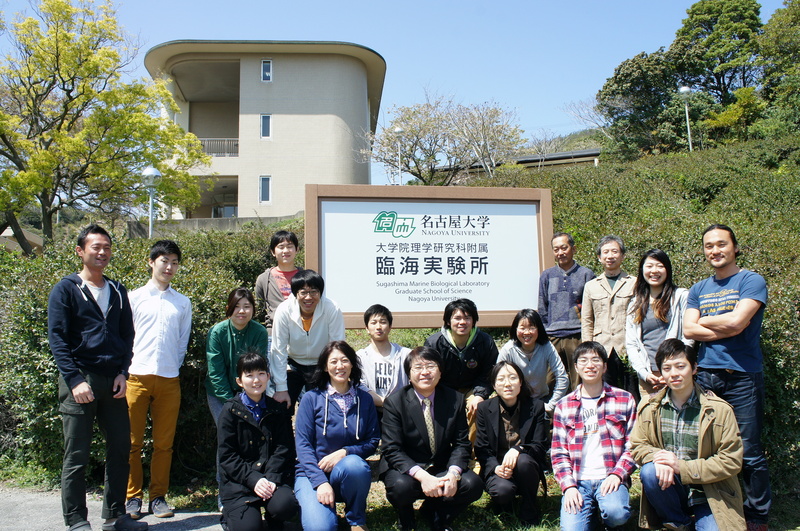 Group of Marine Developmental Biochemistry | Division of Biological Science, Graduate School of Science, Nagoya University. Fertilization involves sperm-egg interactions and is precisely controlled by many molecules within the gametes. After a sperm binds to the vitelline coat of the egg, it releases a lytic agent, lysin, which digests the vitelline coat and allows the penetration of sperm. In order to understand the lysin system, we have been studying the fertilization mechanism in ascidians (Tunicata). We chose these organisms because large quantities of readily fertilizable gametes can be easily obtained from them. Although ascidians are hermaphrodites, releasing sperm and eggs nearly simultaneously, many ascidians, including Halocynthia roretzi and Ciona intestinalis, are self-sterile. Since vitelline coat-free eggs are self-fertile, the lysin system appears to be activated after a sperm recognizes the vitelline coat of an egg as nonself. In H. roretzi, we have shown that two sperm trypsin-like proteases, acrosin and spermosin, are involved in the sperm binding and penetration of the vitelline coat. We have also found that an extracellular ubiquitin-proteasome system of sperm origin functions as a lysin. The target for the ascidian lysin was found to be a 70-kDa vitelline coat protein, HrVC70, which consists of 12 epidermal growth factor (EGF)-like repeats. We have demonstrated that HrVC70 functions not only as a sperm receptor but also as a candidate allorecognition protein during fertilization of H. roretzi. Several observations support this hypothesis. First, HrVC70 is attached to the vitelline coat during oocyte maturation, the process during which self-sterility is acquired. Second, fertilization is strongly inhibited by pretreatment with HrVC70 from a different individual, but not from the same individual. Third, the number of nonself sperm bound to HrVC70-agarose is higher than the number of self-sperm. Finally, HrVC70 is a highly polymorphic protein, showing several amino acid substitutions among different individuals. Our current research aims to identify the sperm ligand for HrVC70 and to elucidate the molecular mechanisms underlying self/nonself-recognition in the gamete interactions of this species. In C. intestinalis, we recently succeeded in using genetic analysis, positional cloning and proteomic analysis to identify promising candidate proteins responsible for self/nonself-recognition during fertilization. Genetic analysis revealed that two genetic loci, which reside in chromosome 2 (A-locus) and 7 (B-locus), are responsible for self-incompatibility. Both loci contain highly polymorphic sperm polycystin 1-like proteins, which are referred to as s-Themis-A and -B, and highly polymorphic fibrinogen-like proteins on the vitelline coat, called v-Themis-A and -B. These proteins appear to play a key role in the allorecognition system. Interestingly, v-Themis genes reside in the first intron of s-Themis genes. From genetic analyses, s-Themis-A and -B appear to recognize v-Themis-A and -B, respectively. When s-Themis proteins recognize the corresponding v-Themis proteins as self-proteins, sperm must recognize the vitelline coat as self and detach from the vitelline coat. These results indicate that the self-incompatibility system of C. intestinalis has a similar framework to that of flowing plants but utilizing different proteins. In addition to the studies of fertilization, we are also interested in the mechanisms of endothelial cell apoptosis and hemorrhage induced by snake venoms. We have purified and characterized certain ADAM-family proteins, vascular apoptosis-inducing proteins (VAPs), from snake venoms; these proteins have potent apoptosis-inducing activity. We recently succeeded in revealing the three-dimensional structures of these proteins. We are now focusing on the substrate specificity of the protease domain and the signal transduction pathways that function during VAP-induced apoptosis and hemorrhage. Working hypothesis on the self-incompatibility system during fertilization of the ascidian Ciona intestinalis. 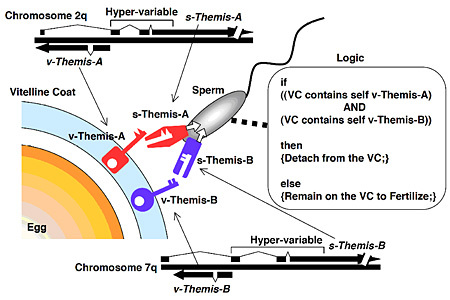 If a sperm recognizes the vitelline coat as self, which is mediated by both interactions between v-Themis-A and s-Themis-A and between v-Themis-B and s-Themis-B, sperm is detached from the vitelline coat. In the other case, the sperm is allowed to penetrate the vitelline coat and fertilize the egg. Sawada, H., et al. eds. (2014). Sexual Reproduction in Animals and Plants, Springer. Saito, T., et al. (2012). Self-incompatibility response induced by calcium increase in sperm of the ascidian Ciona intestinalis. PNAS 103:4158-4162. Yamada, L., et al. (2009). Comprehensive egg coat proteome of the ascidian Ciona intestinalis reveals gamete recognition molecules involved in self-sterility. J. Biol. Chem. 284:9402-9410. 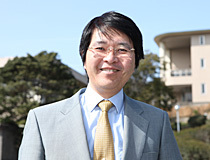 Harada, Y., et al. (2008). Mechanism of slef-sterility in a hermaphroditic chordate. Science 320:548-550. Urayama, S., et al. (2008). Ascidian sperm glycosylphosphatidylinositol-anchored CRISP-like protein as a binding partner for an allorecognizable sperm receptor on the vitelline coat. J. Biol. Chem. 283:21725-21733. Yokota, N., and Sawada, H. (2007). Sperm proteasomes are responsible for the acrosome reaction and sperm penetration of the vitelline envelope during fertilization of the sea urchin Pseudocentrotus depressus. Dev. Biol. 308:222-231. Takeda, S., et al. (2006). Crystal structures of VAP1 reveal ADAM’s MDC domain architecture and its unique C-shaped scaffold. EMBO J. 25:2388-2396. Ban, S., et al. (2005). Highly polymorphic vielline-coat protein HaVC80 from the ascidian, Halocynthia aurantium: Structural analysis and involvement in self/nonself recognition during fertilization. Dev. Biol. 286:440-451. Sawada, H., et al. (2004). PNAS 101:15615-15620. Sakai, N., et al. (2003). Extracellular ubiquitin system implicated in fertilization of the ascidian, Halocynthia roretzi: Isolation and characterization. Dev. Biol. 264:299-307. Sawada, H., et al. (2002). Self/nonself recognition in ascidian fertilization: vitelline coat protein HrVC70 is a candidate allorecognition molecule. PNAS 99:1223-1228.